I didn't believe in time travel or teleportation until it happened to me. I'm Bruce Gernon, and I flew through the heart of the Bermuda Triangle before I'd even heard the term. Skeptics have dismissed the Triangle as a nonmystery, but they weren't in my airplane when the fog surrounded my craft and I leaped ahead 100 miles. I documented what happened and memorized every detail of that flight. Now I'm ready to explain that there is no Bermuda Triangle! Instead, there is a continuing mystery that has resulted in thousands of disappearances of crafts and loss of life over decades and centuries: a phenomenon I call electronic fog. 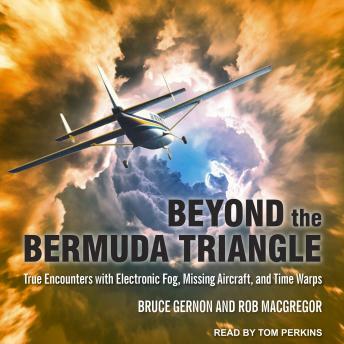 In Beyond the Bermuda Triangle, Rob MacGregor and I present multiple cases of pilots and others who have experienced electronic fog in the air, in the water, and on land. We also examine UFO and USO cases and their possible relationship with space/time warps. Among the fascinating topics we explore are time travel and teleportation; lost crafts, including Flight 19; the Dragon's Triangle; the Underwater Area 51; the man who is building a warp drive; and a remote viewer who takes on the Triangle.